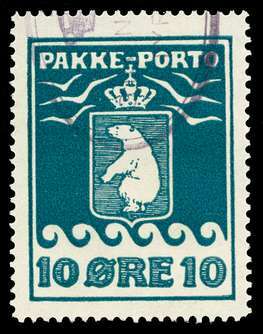 A very nice range of Pakke-Porto stamps in excellent condition, including some very hard to find printings (colors). 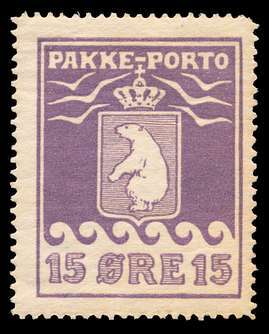 Please also see Pakke-Porto stamps listed in the following Sections: Regular Pakke-Porto Stamps, New Arrivals, Bargain Stamps, Village Cancellations on Pakke-Porto Stamps, and Savings / Avane Cancellations on Pakke-Porto Stamps. Scott #Q2, Facit #P5IC2, Wowern #13a, the First Printing on thick white paper, Officially Reperforated on the right side. Used with Superb centering and light cancellation. Accompanied by Wowern photo certificate. This officially reperforated issue is very difficult to obtain in such nice quality. Scott #Q2 Grayish Brown Paper, Facit #P5II, Daka #7II, Wowern #19, the Second Printing on thin, hard grayish-brown paper. Used Superb with perfect centering and neat (correct type) corner cancellation. Very pretty! Scott #Q2, Facit #P5IC2, Wowern 13a, Daka 7IE Used VF Officially reperforated at bottom with extraordinarily nice perforation "tips" at bottom. Accompanied by Lasse Nielsen photo certificate. Beautiful color, fresh appearance. 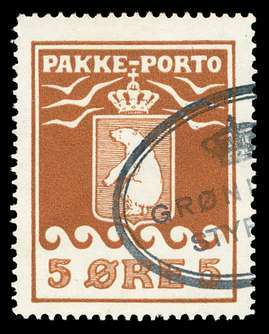 Scott #Q3, Facit #P6II, Daka #8II, Wowern #23 [5 øre Pakke-Porto, 1924 Printing II, Light Red Brown, Perforation 11.5] Used with Superb centering and neat oval cancellation. 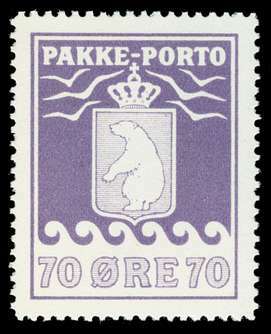 A wonderful example of a stamp that is quite difficult to find in nice quality. 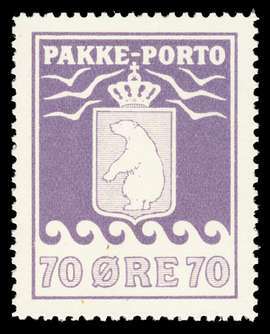 Though a great example of this particular printing, it is priced only as a normal stamp. 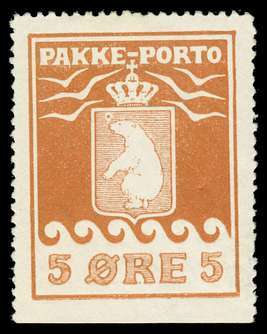 Q3, Facit #P6III, Daka #8III, Wowern #30 [5 øre Pakke-Porto, 1928 Printing III, Dark Red Brown, Very Thin Paper, Perforation 11.5] Used with VF+ centernig and very neat cancellation. Very attractive and fresh! 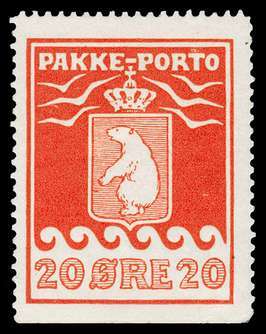 Scott #Q3a, Facit #P2IIBv, Daka-Wowern #4b [5 øre Pakke-Porto, Perforation 12.25, Printing II, 1910 Light Red Brown] Mint with Superb centering and lightly hinged, but with small thin spot at top. 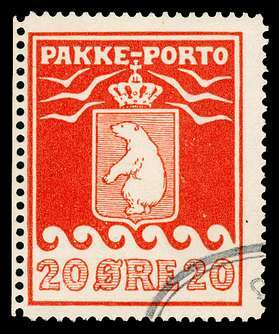 Wonderful example of the "ball above nose of bear" variety from position 24 -- listed by all the specialized catalogs. 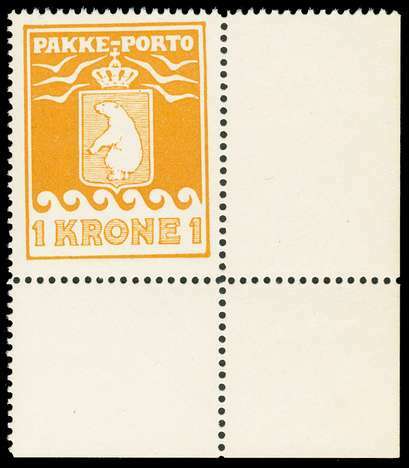 Straight edge at bottom, which it MUST have for this variety on this printing (unless it is officially reperforated of which only 25 originally existed). Only 375 of this variety on this printing (not officially reperforated) could have originally existed. The vast majority were either used, badly damaged, discarded, or lost to time. This is as nice looking an example of the variety as one could hope to find (and remember, on this printing, it must have the straight edge at bottom). Without the thin spot, this would command $1100! Seldom offered and especially not at such a low price. 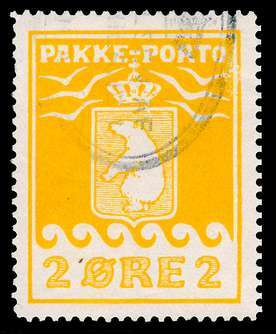 Q4b, Facit #P7IV, Daka #9IV, Wowern #31 [10 øre Pakke-Porto, 1931 4th Printing, Perforation 11.5] NH with Superb centering. Very attractive and fresh! 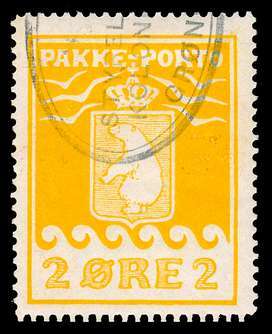 Q4b, Facit #P7IV, Daka #9IV, Wowern #31 [10 øre Pakke-Porto, 1931 4th Printing, Perforation 11.5] Used with Superb centering and neat cancel. Very attractive and fresh! 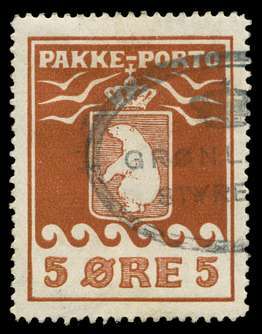 Q5 THICK PAPER, Facit #P8II [1915 15 øre Pakke-Porto, 1923 Thick Paper printing] Mint F-VF+ centered example. Very fresh and attractive. 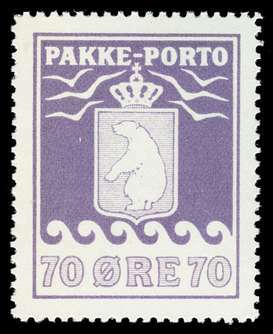 Scarce stamp missing from most collections; most European-printed albums have a space for this thick-paper version. 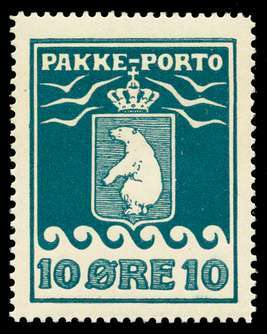 Q5 THICK PAPER, Facit #P8II [1915 15 øre Pakke-Porto, 1923 Thick Paper printing] Mint F-VF+ centered example with very light and small hinge mark. Very fresh and attractive. 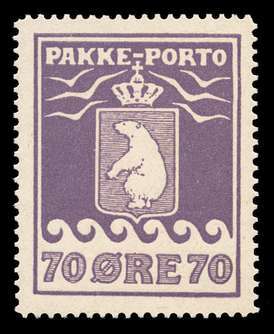 Scarce stamp missing from most collections; most European-printed albums have a space for this thick-paper version. 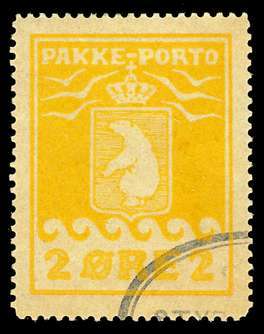 Q6, Facit #P9IB [Pakke-Porto 20 øre 1915 printing] Mint F-VF+ with natural straight-edge margin at bottom. Nice example of Wowern variety Fh "small white line under wing of middle seagull on left" from position 23. Bright color and very large margins. The first printing is scarce. 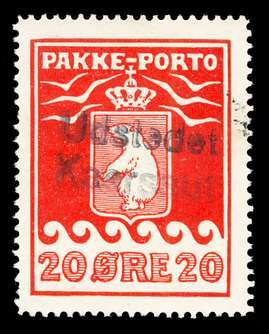 Q6 [1915 20 øre Pakke-Porto, Perforation 11.25; probably Print VI] Used VF+ with VF+ strike of 2-line "Udstedet / Kaerssut" village cancellation in black (Wowern 1981 GF1 #63.01) -- a scarcer postmark. 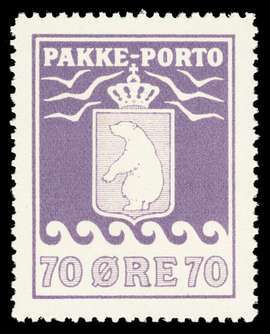 The stamp has Wowern plate variety "Fe", flattened top frame line at left corner. 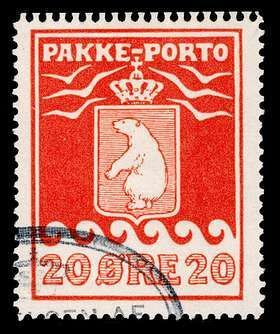 Wonderful centering and very neat cancellation, but one minor blunted perforation tooth at left. Such nice strikes of village cancellations are scarce! Scott #Q6, Facit #P9IC2, Wowern 15a, Daka 11IE Used, Officially reperforated at top, with VF centering. Accompanied by Lasse Nielsen photo certificate. Excellent example! Scott #Q6, Facit #P9IC2, Wowern 15a, Daka 11IE Used, Officially reperforated at left, with F-VF centering. Perfect example of the reperforation with full (narrow) margin outside perforation, not just the perf tips -- this is rarely seen thus. Accompanied by Lasse Nielsen photo certificate. 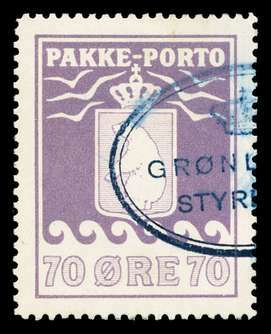 Q7a (Facit #P10a thin paper) [1930 70 øre Perforation 11.25] NH with VF+ centering. Wonderfully fresh example. It would be very hard to find nicer! Scarce in NH condition; rare with such nice centering. Q8 [1937 Perf 10.75 (Scott Perf 11)] NH VF lower right corner margin example (lightly hinged in margin, stamp NH). Wonderfully fresh. 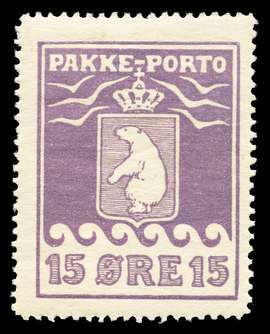 Q10 Violet [1937 70 øre Redrawn Design, Lithographed, Perf 11] NH Superb. Wonderful example. 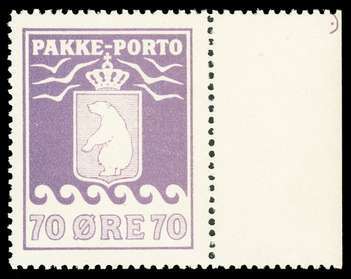 Q10 Violet [1937 70 øre Redrawn Design, Lithographed, Perf 11] NH VF++ right margin example showing an unusual registration (?) mark in the margin. 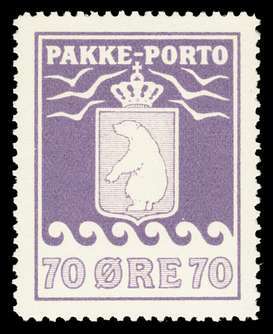 Q10 Violet [1937 70 øre Redrawn Design, Lithographed, Perf 11] Used Superb, with neat oval cancellation of proper type and time period. Wonderful example.